At the April 16 Zionsville Chamber of Commerce Business Breakfast at Zionsville Town Hall, Lt. Gov. 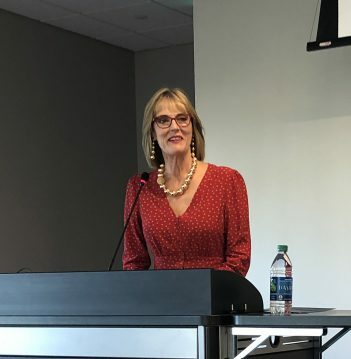 Suzanne Crouch spoke on the Next Level Connections program. To begin her presentation, Crouch informed the crowd about Indiana being the nation’s leader in advanced manufacturing. She said the state has the second-best infrastructure and is the second most affordable state in the nation. Crouch said the Next Level Connections investment will invest $100 million in expanding broadband statewide. Other portions of the Next Level Connections investment would invest $90 million in creating a world-class network of trails and $20 million in providing more nonstop, international flights. The Zionsville Chamber of Commerce holds its business breakfasts monthly. For more, visit zionsvillechamber.org.